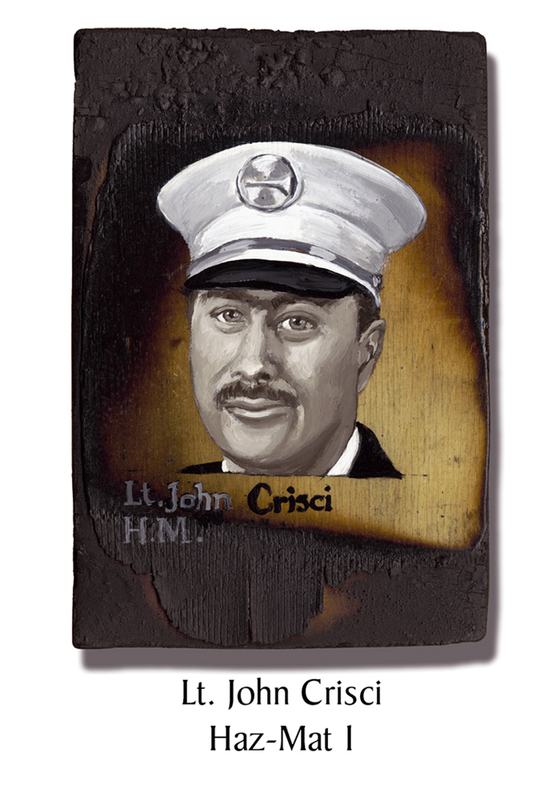 Lt. John Crisci, 48, had joined the FDNY in 1977. He had 24 years in. In 1989 he had been honored with the Chief John J. McElligott Medal for saving a little girl in a tenement fire. He had been made a Fire Marshall before Lieutenant and taught rescue techniques at The Rock. That morning his shift finished at 8AM but he was still in the firehouse when firefighter Kevin Smith watched the plane strike Tower One from the open doorway. Crisci rode in heavy, along with Welty from Squad 288, and a probie. Not yet sure if they were being called to respond as Haz-Mat or Rescue, he ordered the probie to stay with the truck, which saved his life. This entry was posted in Better Angels Stories and tagged 343, 9/11, better angels, Dawn Siebel, FDNY, firefighter, firefighters, firefighters of 9/11, Haz-Mat 1, John Crisci, LODD, Manhattan, memorial, NFFF, paintings, portraits, World Trade Center, WTC. Bookmark the permalink. I was the probie. I was assigned to Engine 280 but had stopped by Haz-Mat 1 to see a friend on the morning of 9/11. When Smith witnessed the first aircraft strike the north tower, we all got on the rig. I rode into Manhattan with Haz-Mat 1 and sat near the rear door of the rig next to Timothy Welty. Upon arriving at the WTC, we parked on the corner of West and Vesey streets. As I dismounted the rig. Lieutenant Crisci gave me an order to stay with the rig and Firefighter Anthony Costagna. In his eyes I could see deep concern for my personal safety (along with deep care and compassion for those he was about to save in the towers) as he spoke to me. It was the last time I ever saw the Lieutenant. His command presence and leadership were inspiring. Therefore, I am sure his men felt extreme confidence in him as he lead them that day. His decision was the first of several by great FDNY leaders that kept me alive that day. Although I did not know him well, I think about him often and will never forget what he did for me. I strive to maintain his memory even today and vow that he will always be honored.